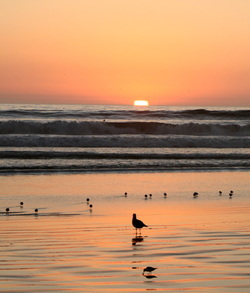 I hesitate to write about Pismo. The feeling I’m experiencing is similar to opening Sunset Magazine and finding one of my favorite mountain biking towns being touted as a weekend destination.“Come on” I think to myself, the place has world class mountain biking, a taco joint, a post office, a store for Gatorade, beer and toilet paper. My fear: a place, that once “discovered”, is at risk of losing it’s original character to the homogenized demand of suburban America. Pismo has long-surpassed the “hidden” or “unknown” designation so I set my reluctance aside and share one of my all-time favorite places with you. Pismo beach, located on HWY-1 90 minutes north of Santa Barbara and 20 minutes south of San Luis Obispo is a sleepy little beach town of 7,500 people and 13.5 square miles (10 of which is water). It extends along a gorgeous stretch of beach. Pismo was once known as the “Clam Capitol of the World”. Overharvesting by humans and feeding by sea otters has all but obliterated the clams so the new 21st century moniker is “Classic California”. I don’t know exactly what that means but born and raised a CA girl, Pismo touches my soul. little pup with a fine balance of ferocious independence and loving dedication and regard for me. 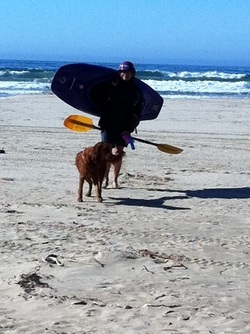 I was beside myself with excitement at the idea of her bounding in the waves for the first time. We parked the RV and without further consideration, headed for the beach. We walked out of the state campground, up and over the cypress laden dunes and upon seeing the expanse, the little pup became strictly self-indulgent. Upon releasing her leash, she leapt into the air, dropped back to the sand, twisted, turned, chased her tail, leapt again, buried her nose in the sand, ran back to my side like a child pinching their wrist and begging the question: “is this for real mama? Huh, is it?” She ran away gangly, dove and slid, burying herself in the warm sand. I watched and laughed - more heartily than I had in many months. Pismo beach is our second home. Walk over the dunes at dusk and be astounded at the richness in the color of the sunset. I’ve been to Pismo dozens of times and the sunset never ceases to amaze me. It is a great pleasure to watch people, who rarely leave the comfort of their RV with three flat screens, carry their beach chair, point and shoot and often a glass of wine to partake of the Pismo Beach sunset. No trip to Pismo is complete for me without a trip to “the doctor”. This being written by a Christian Science practitioner, you know this is good stuff! “The Doctor” as Doc Burnstein’s Ice Cream Lab is affectionately called is the handmade ice cream shop in Arroyo Grande just a few miles south-east of wherever you are camping on the beach. I generally go there after a long bike ride along the coast and through nearby rolling vineyards. Signature flavors being too many to list, I indulge in: Caramel Explosion, sour cherry sorbet, and Doc’s java.